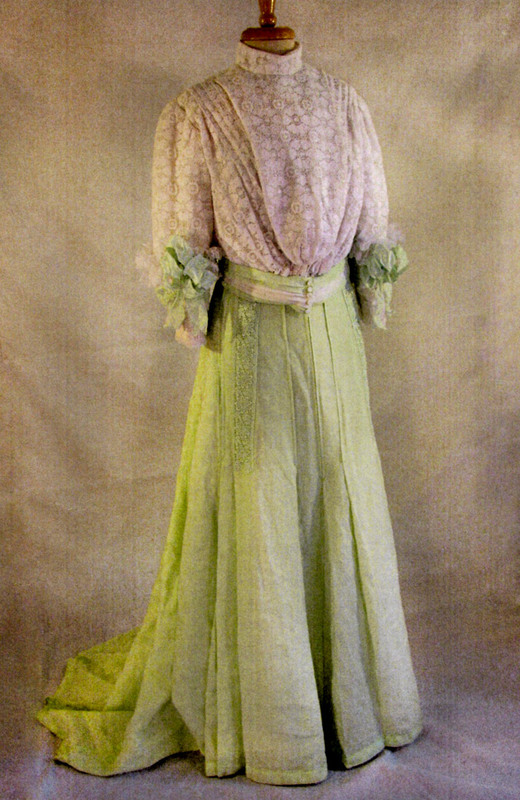 We present here, from the 1905 Lucile, Lady Duff Gordon autumn catalog our interpretation of her elegant outfit titled ” The Tender Grace of a Day That is Dead”. Please don’t ask us to understand, interpret or explain the rather creative name for this visually delightful visiting suit. Lucile evidently had a very unique sense of style and many of her creations have absurd and unexplainable names. In any case, the garment is quite striking. The original was actually green wool, in a rich hunter shade. 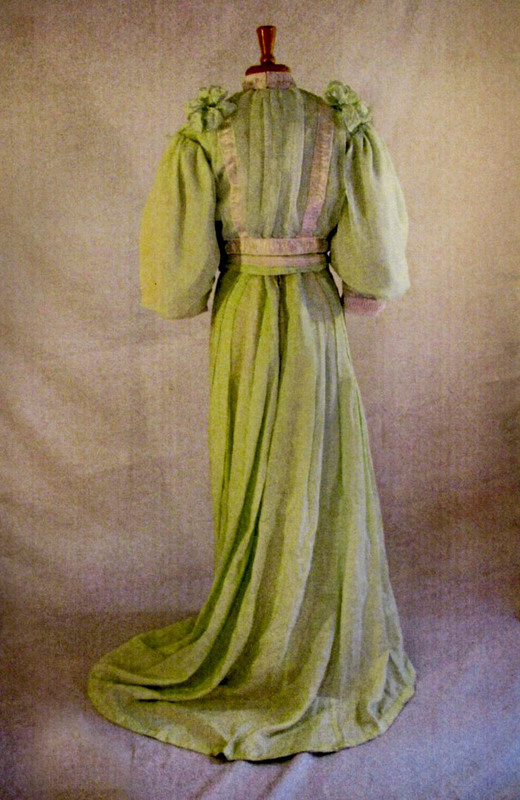 The jacket was overlayed with a mint or chartreuse chiffon including the sleeves. The client for the original of this suit, again due to the climate in Atlanta, chose linen and silk chiffon for the materials. 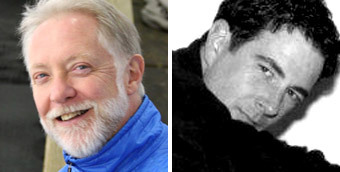 Once again the adaptability of a Past Patterns creation worked wonders in reproducing an historic garment. This is a four piece suit. The skirt and underskirt are built onto a single waistband. The underskirt is silk taffeta. 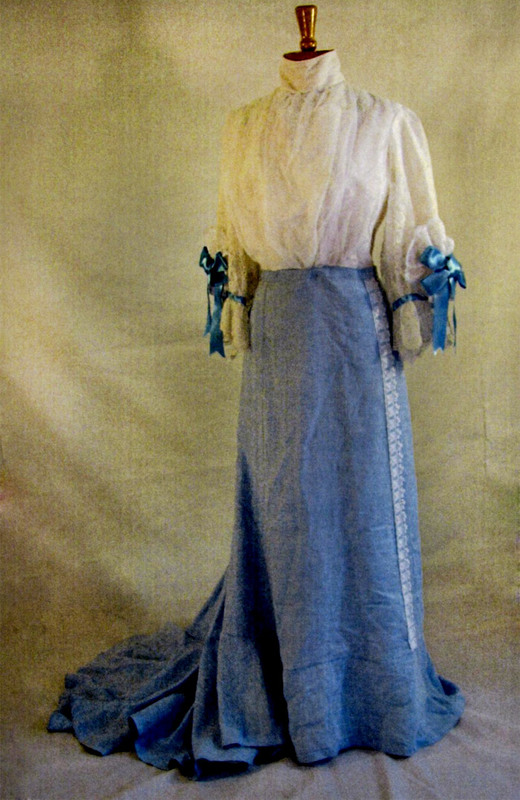 The linen over skirt is of considerable complexity. Each side contains seven panels which are folded into deep pleats, pressed and stitched to knee level where they are released and allowed to flair to the hem. 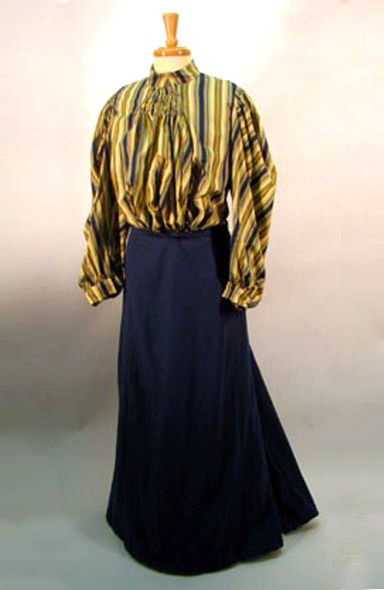 The pleating allows the skirt to cling to the hips of the wearer and then release to allow for easy walking. 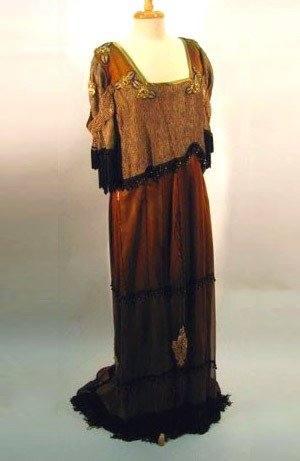 The blouse is very complex as well and consists of three layers and an applied front pouch. 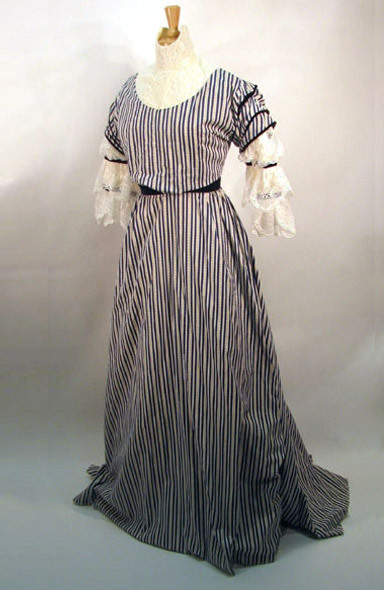 The lining is silk taffeta body fitted, lightly boned but with the finished side toward the wearer, and closes using hook and eye tape center front. 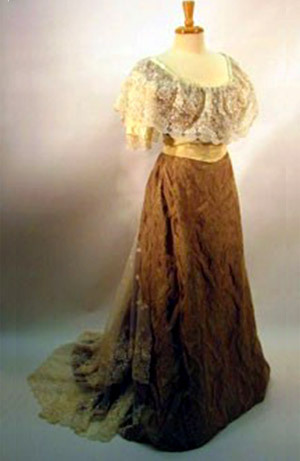 The outer layer is silk taffeta with cotton machine lace worked as one. 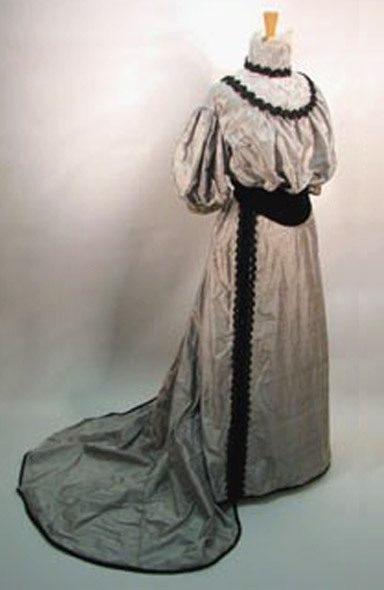 The materials are pleated in tiny folds on the front shoulders and release at bust level to create the Edwardian pouter pigeon front. This layer closes center front as well again using hook and eye tape. The center pouching is an applied, fully lined piece sewn into the right shoulder seam and fastening on the left shoulder. The sleeves are trimmed above the cuffs with netting, mint green machine lace tape and wired silk taffeta double bows. The faux belt on the blouse is made of three pieces of linen which are hand pressed into tiny lengthwise folds, hand joined to each other and then hand applied to the blouse hem. Tiny mint green mother of pearl flat buttons hide the center front hook and eye closure. 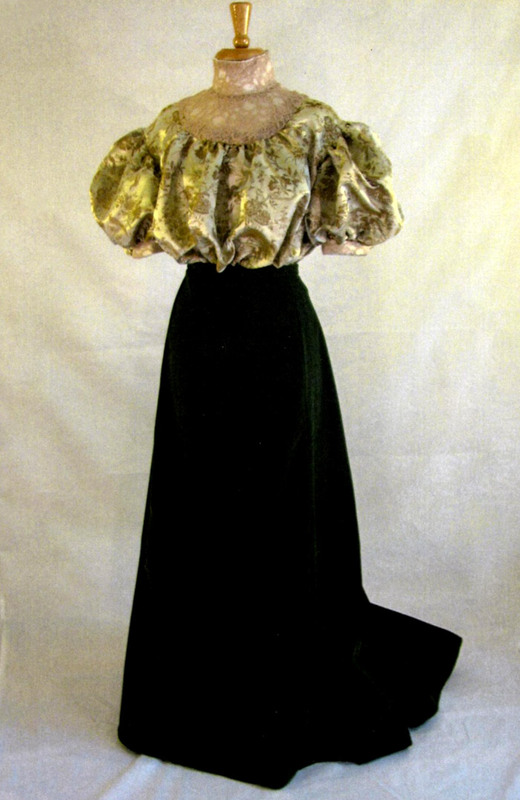 The tailored jacket is lined in silk taffeta. The lapels are covered in the linen, while the jacket body and sleeves are the linen covered in mint green silk chiffon. The jacket is trimmed in mint green machine lace tape, which matches perfectly. The tape is also used on the skirt over two of the front pleats down to the knees. The jacket additionally has embroidered silk satin sculpted ribbon trim in bands on the jacket body and sleeve cuffs. 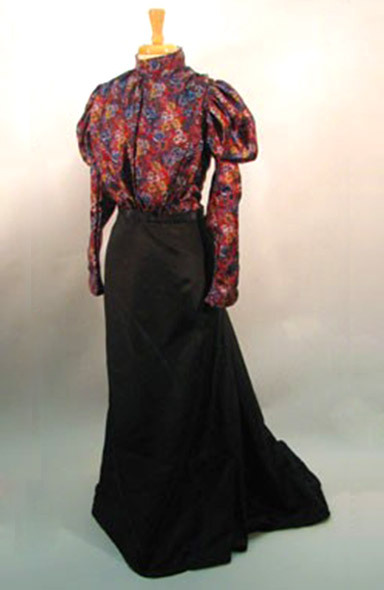 The shoulders are trimmed with the wired silk taffeta in double bows. The client who purchased this suit has coppery red hair and classic very white skin and looked amazing and splendid in this garment as her coloring was perfect for the concept. 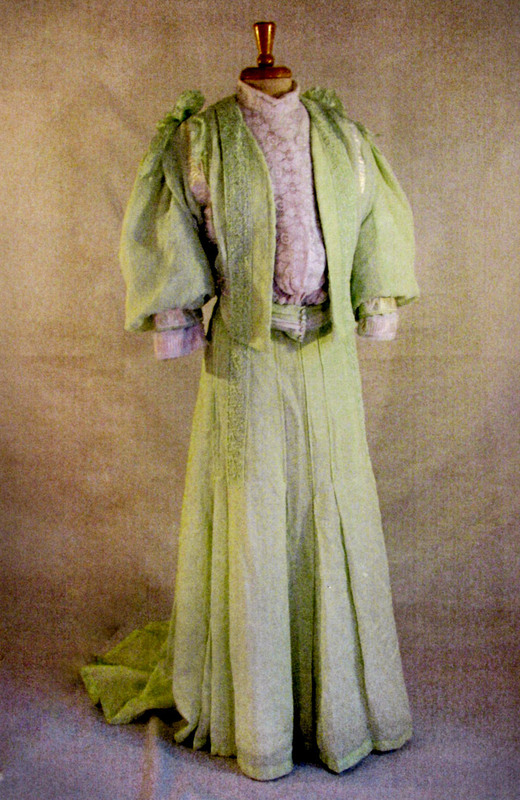 She wears this suit with a matching mint green lace parasol, gloves and a broad brimmed hat in several shades of green.